Are you prepared for Valentine’s Day? 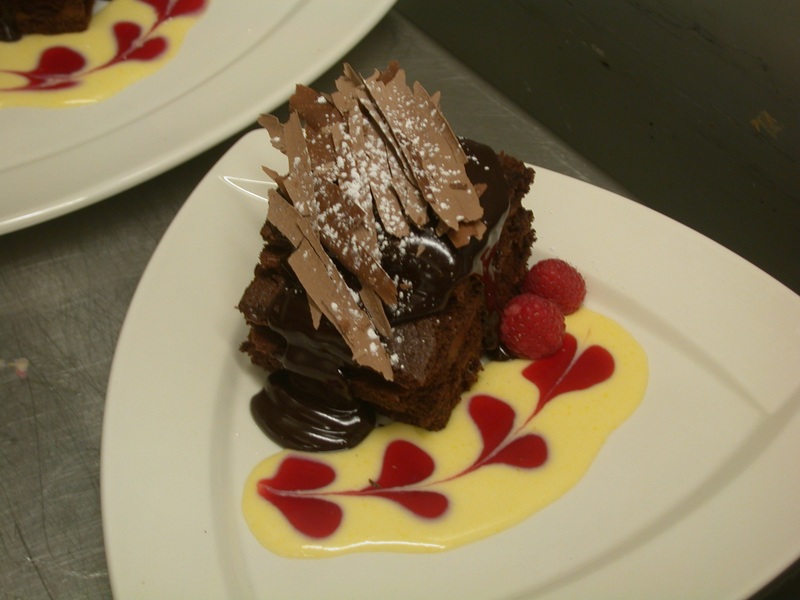 Chef J has a fabulous menu that is sure to impress your honey! Share the love, Chef J! Pink and red are everywhere! You can’t do any shopping right now without being bombarded with lacy, frilly sentiments of amoré. It’s Valentine’s! Time for stuffed bears holding hearts, heart-shaped boxes of chocolate, hearts with cute phrases on them, and best of all: enough steak and lobster to give you a heart attack! My number one tip to make your Valentine’s Day successful: do not make reservations! Every restaurant will be full of couples; some old, some new, all trying to have a romantic evening. I have nothing against romance. I love it! But after years in the restaurant business, seeing packed houses full of V-Day patrons, I have learned that it’s usually an event marked by over-trying and under-thinking. Instead of trying to plan the perfect Valentine’s date, think of what your partner’s perfect night would be. It might be dressing up and stuffing yourselves with surf ‘n turf- because that is awesome! But it could also be a night in with movies and ice cream. Luckily, Valentine’s Day is on a Friday this year so you can sleep in the next day. It doesn’t matter what you do to show the one you love just how much they mean to you as long as it’s from the heart. Instead of a fancy restaurant, make dinner for your honey. Or cook together! Creating your own Valentine’s Day meal as a team can be fun and romantic. How about a tender filet with mushroom ragout? My sweetie is getting grilled cheese because that’s her favorite, but dessert will be something a bit more fancy. Let’s start off with the steak. There are lots of options when it comes to steak, so choose one that fits your tastes and budget. Remember to keep carry-over cooking in mind; the thicker the meat, the more carry-over it will have. Take your steak out of the fridge or cooler at least 30 minutes before cooking. Salt your steak just prior to cooking. After cooking, let the steak rest in a warm (not hot) place for 5-10 minutes before slicing. Don’t slice into meat to check for doneness: use a thermometer or judge by tenderness. Heat the oil in a saucepan. Sear the mushrooms until they are browned and lose liquid. Add shallots and garlic and cook until golden brown. Add the wine and simmer until dry. Add stock and reduce to one half. Add truffle oil and cold butter; whisk until emulsified and season to taste. Serve over prepared steaks. Melt the butter and chocolate together in a double boiler. Whip the eggs slightly until blended. Slowly add the sugar and whip until fluffy, about 5 minutes. Mix the agave, vanilla and adobo into the chocolate. Slowly stir the melted ganache into the egg mixture. Sift the cinnamon and flour together, toss with the pecans and slowly add the wet mixture. Remember to scrape the bowl! Pour the mixture into paper-lined muffin pans, no more than half full. Bake until just set, about 20 minutes. OR you can bake them in a traditional brownie pan for about 25 minutes, or until a toothpick almost tests clean. Allow to cool completely in the pan. Move to the freezer and let them chill for about 30 minutes. Combine the sugar, water and half of the lemon juice; bring to a simmer and add the berries. Mix the corn starch and water. Bring to a boil and stir in the slurry. Return to boil while stirring constantly. Strain and cool to thicken. Transfer to a plastic squeeze bottle. Whip the egg yolks until frothy, add the sugar and whip until dissolved. Whip in the vanilla bean paste and slowly stir in the milk. Return the mixture to the heat and cook while stirring constantly, until thick enough to coat the back of a spoon. Remove from heat and strain to remove any lumps. Spoon a pool of Crème Anglaise onto one side of a plate. Squeeze a few dots in a row of Berry Coulis on top of the Crème. Starting at the top dot, drag a toothpick or skewer through the center of each dot in one steady motion to create hearts (see picture). Place a brownie on the opposite side of the plate and garnish with fresh berries, mint, chocolate shavings, more Coulis, ganache…whatever your Valentine desires! Serve with a deservedly smug look on your face.